LIVE AT THE LAKE ~ MAGNIFICENT SUNSETS! Exceptional lodge style home with waterfront views, sits on 4.91 ACRES m/l. Enjoy fishing from your boat, dock, or bank. Experience a leisurely walk, bike ride, hiking, or four wheeling on the off-road trails throughout the timber. Updates include newly installed hardwood floors, a gas forced heat pump, and central air. This GORGEOUS home features an open kitchen, a large living room with a new fireplace, spacious master bedroom, and a 30'X40' heated 2-car detached garage with an insulated loft allowing for great storage. 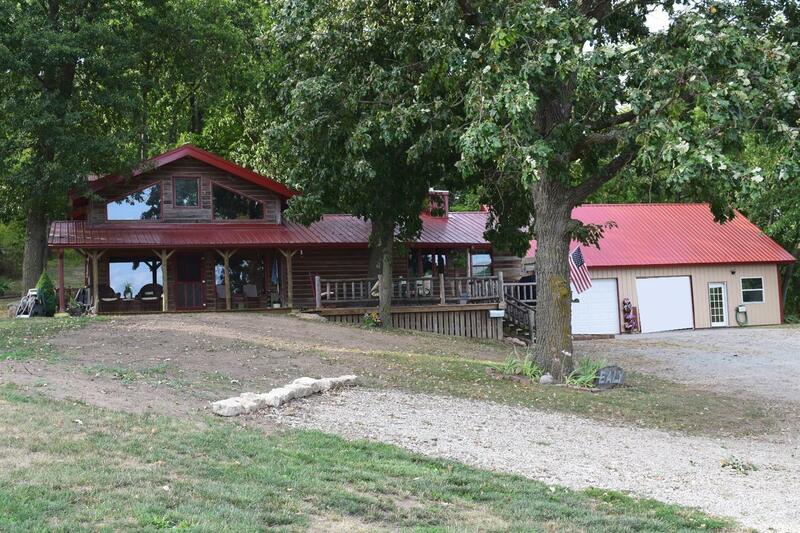 The abundance of wildlife makes this an excellent recreational property, or a perfect home for a retired couple with the most beautiful views in southern Iowa. Privately, located at the end of Blackberry Ridge Road, Unionville, IA. This subdivision borders Stephen's Forest State Park. You won't want to miss out on this spectacular property.